« Are You A Super-Recognizer? How do you tell someone where you are? Most of us would use some form of a postal address to identify our location. But what if you’re in a place that doesn’t have a postal address? In other words … most of the world. If there’s no postal address, I might use latitude and longitude. For instance, our home is located at 39.714549 latitude and -104.971346 longitude. If you understand the system, you’ll realize that my house is 39 degrees north of the equator and 104 degrees west of the prime meridian that passes through Greenwich, England. Longitude and latitude give us precise locations, but they’re not human friendly. It’s like noting that the current temperature is 287.039 degrees Kelvin. That’s accurate but not terribly meaningful to most humans. So, is there a way to map the world that would be easier for humans to manage? Well, how about we divide up the entire surface of the earth into squares that are approximately three meters per side? Each square is nine square meters or roughly 90 square feet. As you’ve no doubt calculated by now, we would need about 54 trillion such squares. That may sound complicated but, really, how hard is it to manage 54 trillion squares? The researchers at What3Words – a start-up company in London – figured out that you only need 40,000 words in three-word combinations. That yields about 64 trillion combinations – enough to address the world and have a few trillion combinations left over. In the world of What3Words, our home address is quit.snacks.humid. It’s easy to remember and precise enough to guide you to our front door. If I wanted to guide you to our driveway, I would instead use the words refuse.fake.limbs. If I wanted to send you to the highest summit in Colorado – a place that doesn’t have a postal address – I would send you to penned.metro.inspections. 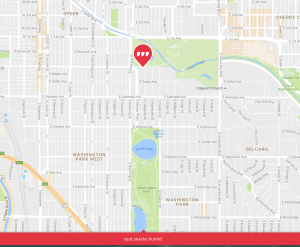 What3Words already has some interesting use cases and, if it develops fully, it should help us with logistics, emergency services, scheduling, and materials management. But its real potential comes from the fact that it’s released not as a solution but as a platform. As we know, (click here, here, and here) platforms are innovations that generate innovations. As other application developers adopt and adapt the platform, we could see a rich ecosystem of solutions that even the What3Words folks can’t imagine today. By the way, I’m taking a few days off. If you need me, I’ll be at tent.quarrel.charm. Fascinating. The innovative mind is a joy to discover. Thanks. Hadn’t heard of that so it was interesting to learn. And try (Brooklyn, eh?). Remembering three words — easier than numbers?